Hit & Run is a wild ride that never should have worked, but surprisingly it does. The story doesn't appear to be deep or complicated, and just when you think they've come to the end, a whole other angle begins. The film is further helped by a large cast and a whole bunch of interesting cameos, that help take it to another level. Charlie Bronson (Dax Shepard) is happy living in a small town with his girlfriend, Annie (Kristen Bell), but things are about to change. When Annie gets offered a job in L.A., Bronson must decide whether or not to go with her, which also means leaving the safety of the witness protection program. When a jealous ex learns of the plan, he finds out who Charlie really is, and thanks to Facebook, connects with the men he's hiding from, making the trip to L.A. a dash for safety, across California. Dax Shepard is not an actor I find to be very funny, but this was the first time I've seen him play a character as deep as Charlie Bronson, and he was terrific. He is being perused by Bradley Cooper of all people, who I did not see as someone who could play the bad guy. His good looks and charming personality, don't exactly lead one to believe he'd be believable as a bad guy, and while he wasn't the toughest bad guy I've ever seen, he does more than an adequate job. 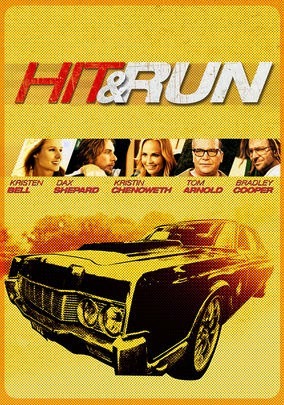 Hit & Run isn't an award winning film, it may not even be all that memorable, but it is extremely entertaining and an edge of your seat thriller ride. The perfect film for those who want to just sit back, relax, and enjoy the show.